(Nanowerk Spotlight) For years, scientists and engineers have worked to design electronics which can interface with the body. However, typical silicon wafer-based electronics, which are planar and stiff, are not suited to interface with the soft, curvilinear, and dynamic environment that biology presents. By exploiting the features of shape-memory polymer (SMP) substrates, an international team of researchers from the University of Tokyo and the University of Texas, Dallas, has now demonstrated a unique form of adaptive electronics which softly conform or deploy into 3D shapes after exposure to a stimulus. The resulting organic thin-film transistors (OTFTs) can change their mechanical properties from rigid and planar, to soft and compliant, in order to enable soft and conformal wrapping around 3D objects, including biological tissue. The results have been published in the April 15, 2014 online edition of Advanced Materials ("Mechanically Adaptive Organic Transistors for Implantable Electronics"). "With this work, we are demonstrating the first electronic device which is fabricated while flat and rigid using adapted microelectronics techniques, but which softens and adapts to the morphology of soft tissue after exposure to physiological conditions, Jonathan Reeder, a PhD student in Prof. Walter Voit's Advanced Polymer Research Lab at UT Dallas, and the paper's first author, tells Nanowerk. "Additionally, these transistors can be made to deploy into 3D shapes in response to heat, which could have useful applications in electronics which can grip tissue such as nerves, blood vessels, or muscles." Flexible electronics have been fabricated on many types of plastic substrates, but typically the softening temperature of the plastic is well above or well below body temperature. As a result, these devices exhibit the the same mechanical properties (stiffness and shape) no matter their environment. "By specifically engineering the electronic substrate to soften in response to body temperature and humidity, we allow electronics to adapt to the dynamic and curvilinear environment inside the body, all while maintaining excellent electrical properties," explains Reeder. Shape memory polymers are smart materials capable of storing a metastable shape and returning in a controlled manner to a globally stable shape upon response to a stimulus, such as heat or light. However, as the researchers point out, in order to fabricate organic thin-film transistors on SMPs for implantable electronics, it is critical to simultaneously achieve both high mobility and low voltage operation of OTFTs on shape changing substrates which adapt at physiologically relevant temperatures; this will enable the detection of small body signals and limit undesirable physiological responses. Another crucial criteria for OTFTs on SMP substrates for implants is the reliability and stability of the devices inside the body. The team fabricated their mechanically adaptive OTFTs by two methods: The first type is manufactured directly on SMP substrates. The second type is manufactured on 1.4 µm PET foils, encapsulated by 1 µm of Parylene, and subsequently coated with a layer of SMP using a transfer-by-polymerization process. For both processing methods, the SMP layer can be partially polymerized, deformed into a complex 3D shape, and then fully cured, allowing for the fabrication of 3D electronics. "After the initial shape changes in the device due to softening after insertion, the device is able to withstand the natural motion of the surrounding soft tissue," says Reeder. The researchers also demonstrated that their OTFTs that can not only conform to complex shapes in physiological environments, but also deploy into a 3D shape to actively grip a target site (see video). 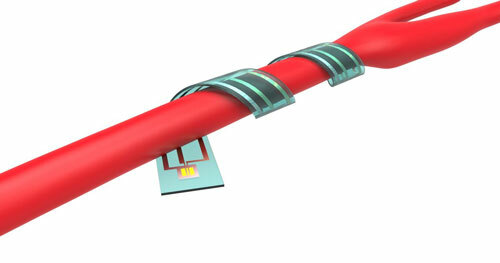 A planar OTFT responds to a temperature change, deploys into a helix and wraps around a rod after being inserted through a 150 µm-thick opening in a thermal barrier. This research lays the fabrication groundwork for future high-performance, robust bioelectronics which will have specific applications in biomedical devices. In particular, devices which can stimulate and interrogate the cerebral cortex, spinal cord, gastrointestinal system, and peripheral nervous system are all areas of ongoing work in the Voit lab. Many of these devices are in collaboration with the Texas Biomedical Device Center which is working to pair scientists, engineers, surgeons, and neuroscientists in the Dallas area for creating research and clinical devices. To date, the main obstacle to flexible electronics becoming commonplace and effective as implants is the long-term biocompatibility of the electronic components. Rigid electronics implanted in soft tissue ultimately fail for the same reason splinters are eventually ejected from under your skin: the body's immune response. This, of course, limits the types of treatments that current devices can be used for, due to the limited time line of effectiveness. Alternatively, electronics have been fabricated on soft plastics in the past such as PDMS and elastomeric polyurethanes, however, these devices are not able to penetrate soft tissue which is useful for brain applications in particular. Another major issue with implantable electronics is the transfer of power and data to and from the device, as connectors are common failure points. Because of this, wireless technology which can eliminate wires is highly desired but has been demonstrated in only a few devices yet. This work is the continuation of two recent papers, one from the Someya lab ("An ultra-lightweight design for imperceptible plastic electronics") and one from the Voit lab ("Three-Dimensional Flexible Electronics Enabled by Shape Memory Polymer Substrates for Responsive Neural Interfaces"). This work was supported by funding from the Japan Society for the Promotion of Science, NSF Graduate Research Fellowship, NSF East Asia and Pacific Summer Institute, and the DARPA Young Faculty Award Program.